By combining a high proportion of fresh meat with a broad range of vegetables, nutritious whole grains and herbs, Natural Dog Food is the first truly balanced complete dog food. This means that everything a dog needs can be found in the raw ingredients so unlike all earlier dog foods, we don’t need to add any artificial vitamins or minerals making Natural Dog Food the first completely natural dog food on the market. 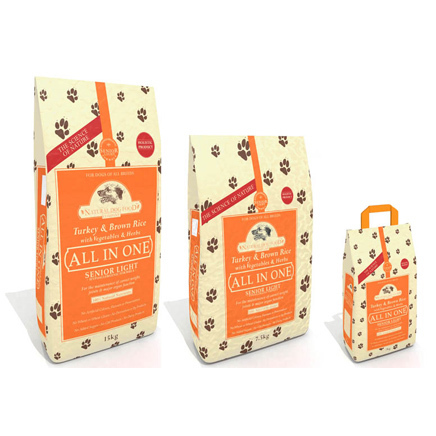 Free from wheat, soya, dairy products, maize, beef, pork and all forms of chemical additives, the entire Natural dog Food Company range is 100% hypoallergenic. All of our products include only a single protein source making them ideal for dogs that are prone to food allergies or intolerances. Natural Dog Food Company have developed a range or foods for the mature dogs and younger dogs that are prone to weight gain which tend to face very similar challenges; joint strain, reduced mobility and impaired major organ function. Natural Dog Food Company Senior/Light caters perfectly for both groups of dogs with its broad selection of therapeutic herbs, specifically chosen to support mobility and organ function. Calorie content is kept low to help ensure a healthy weight is maintained whilst a marginally increased protein level helps to prevent the muscle wastage so often seen in dieting or older dogs. Protein 21%, Oil 7.5%, Fibre 3.5%, Ash 6%.